What initially attracted me to this CD was the fabulously evocative sleeve. It caught my attention and intrigued me enough to investigate it further. 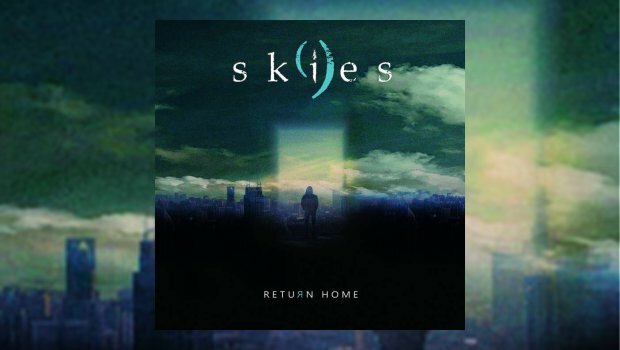 Nine Skies are a French Progressive Rock band from the Southern city of Nice comprising two very different singers and also saxophones and a guest flautist on some songs, this gives the music a light and delicate tone. They are also not averse to using the acoustic guitar for more variance in their sound, as is clearly shown on The Blind Widower (Part Two) before the electric come crashing in. The music is hard to define or classify as there are no real reference points, although I do detect the influence of prog guitarists like Steve Hackett, Andy Latimer and Marillion’s Steve Rothery in the melodious and harmonic guitar solos of Eric Boulette, David Darnoud and Alexandre Lamia, although as I’m working from a download I don’t have full credits as to who plays which ones. Opening with street sounds on the title track, footsteps lead to a solo piano line before a beautiful guitar line is introduced. You can immediately tell that this is a quality release, such is the high production standards right from the off, and a crisp and well separated sound follows with the guitar melody playing across and throughout the track in a very appealing manner. A meatier, more riff-based section follows at the 2:35 mark, keyboards emerge along with some prominent bass work set against the solo guitar. This is a very impressive opener that sets the scene for all that is to come, and very impressive it is too. It’s engrossing stuff with shades of Marillion shining through, but this is very much Nine Skies’ own show and not a carbon copy. Catharsis follows swiftly with an acoustic based introduction on which you can hear the guitar strings squeak, so clear are they. This is only a brief track but it again shows the skill that Nine Skies possess and how they strive to develop their own sound and identity. It’s another memorable track with a good melody running throughout. Next is A Season of Greed which has another great acoustic guitar opening passage, making for a pleasant change to the electric playing that most bands use. This album is not all bombast but shows a range of styles, colours and approaches that compliment the songs. It’s bold, brave and different and for that alone this album deserves hearing, which is rewarded by some intelligent, articulate and interesting music with something worthwhile to say too. I really do like what I’m hearing here and The Blind Widower is no exception, opening with some well constructed piano and synth lines. It’s the longest and the most engrossing track on the whole album, with a jazzy tone it really moves along at a cracking pace. There’s great bass playing here too and rather than just focusing on long guitar solos this is all about playing as an ensemble and letting everyone shine. It’s a terrific tune that impresses hugely, a repeated piano motif at the 5 minute mark setting up the second verse with an impassioned vocal that ushers in a fine flute part from guest contributor Penny MacMorriss and some great acoustic guitar by one the three guitarists. Truly stunning indeed with great dynamics, it’s a very satisfying song. Roses Never Hatch features more excellent bass playing from Bernard Hery before a more traditional electric prog sound is used to fine effect, this time with a graceful guitar break in the midst of things. The absence of electric guitar soloing to this point bears much fruit as it is very welcome and well executed, the song benefiting as a result. The jazzy The Slight Snake is followed by another epic in Dust in Town which is unveiled in another impressive song, a spoken middle section working well to build the atmosphere of the piece. Next is a five and a half minute reprise of The Blind Widower which takes us deeper into the tale through various differing soundscapes, without any words this is a very evocative piece which leads to the penultimate song, Time For Them To Go, with its moody acoustic sound before the vocal is introduced two minutes in. Expressive bass work and the delicacy of the vocals in this gentle track lead us into A Way Back (Return Home) which is initially piano driven, reusing themes from earlier on the album. Another fine vocal and another strong song, memorable with a spoken refrain of “I’m finding my way back home” before a quite staggering and soaring guitar solo takes us away into a rather Genesis-like section with the solo repeated to great effect leading us to a moody closing section – but not before another solo takes us away again. A very impressive close to what is an extraordinary piece of music, and a very fine album indeed. I look forward to hearing more from this band in the future, but for now this is wonderful way to discover Nine Skies, a fabulous new band that I urge you to check out for yourself. Very highly recommended indeed.